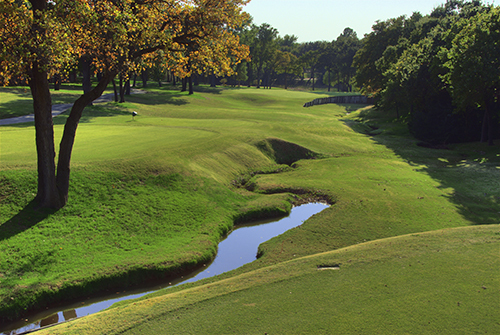 Once upon a time, in any type of all-star, club-versus-club competition, Oklahoma’s Oak Tree Golf Club would have been a prohibitive favorite against pretty much any other private golf club in the world. But that was before PGA Tour pros began descending en masse to Orlando, congregating at posh enclaves like Isleworth and Lake Nona. A look at the all-star lineups paying dues at either high-dollar development is to see the modern essence of golf glitterati---Tiger Woods, Mark O’Meara and Stuart Appleby among other marquee names at the former, while luminaries like Ernie Els, Retief Goosen and Justin Rose in residence at the latter. But these are mostly a bunch of Johnny-come-Lately types, lured to the peninsular state by the agreeable weather and tax advantages. The Oak Tree Gang may not boast the same golf resume—Tiger’s more than seventy Tour wins alone stack up well in comparison to the professional victories garnered by Gil Morgan, Mark Hayes, David Edwards, Doug Tewell, Willie Wood, Bob Tway and Scott Verplank combined. But the Oklahomans have two things that these faux-Floridians do not. The first is authenticity. These are real-deal Sooners, or Cowboys, as the case may be, either by birth, or by osmosis, owing to their collegiate ties at Oklahoma State. Secondly and more importantly is their day-to-day access to one of the finest championship tests in the world—venerable Oak Tree Golf Club. The championship nature of Dye’s creation is revealed immediately, as the opening tee shot must thread its way through a series of oak trees lined up like dominoes, hopefully coming to rest on what can only be described as a single-file fairway. 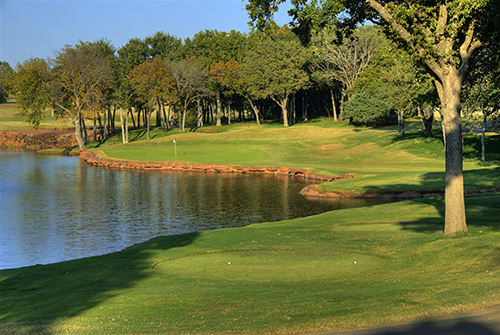 The slightly uphill approach must carry an expansive water hazard, the first of ten holes with a watery mien. 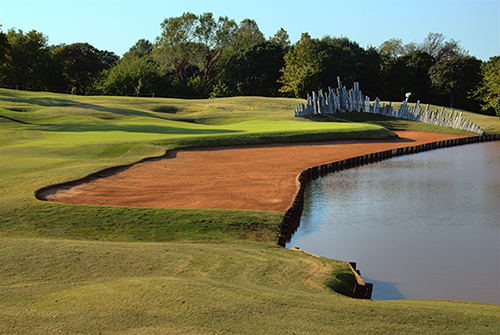 7,400 yards from the tips and with a par of 71, the course can bludgeon with sheer length. But it’s also a test of delicacy, as the heavily contoured greens will often repel any approach shot lacking exactitude. Short irons to the par-5 third or par-4 sixth might look luscious in the air. But come up a foot or two short of these elevated greens and the ball will rebound off of closely-mown collars, careening down the fairway to a waiting collection area, leaving a hit-and-pray recovery shot. The club has since evolved into a different entity, much to the Ryder Cup and President’s Cup stalwart’s satisfaction, as he now visits the club with his wife and children in tow. The neighborhood has also evolved, growing up around the club. It’s no longer in the middle of nowhere, and helicopters have long since stopped buzzing the grounds. However the golf course remains a first-rate, championship test, and one of the finest, most challenging in the nation’s midsection. The mystique of Oak Tree remains intact. In other instances, gnarly, sink-to-the-bottom Bermuda rough awaits an inaccurate approach. Too dainty with the chip and the ball remains in the tangle. Too bold, and it’s a thirty or even fifty-footer left for par, up and over contours on a slippery, multilevel green. And no self-respecting discussion of Oklahoma golf is complete without mention of the wind. It may not always come whipping down the plain, but it comes whistling down the fairway often enough, making a difficult task more wearying.